Yesterday I was surfing the web, and I stumbled upon the home page of a branding agency. And there it was written, in big letters: It all starts with your logo. Nooooooooo! It doesn't, I wanted to yell at them. (Oh well, I can get a little passionate.) I really don't search out other branding web sites too often because I see this all the time and it has the tendency to make me feel just a little bit frustrated. I don't want to go into too much detail today, let's just say I had my reasons for giving that whole branding shebang my own twist. A logo is not a brand. It's a logo. Let me give you an example from the world of rock and roll. 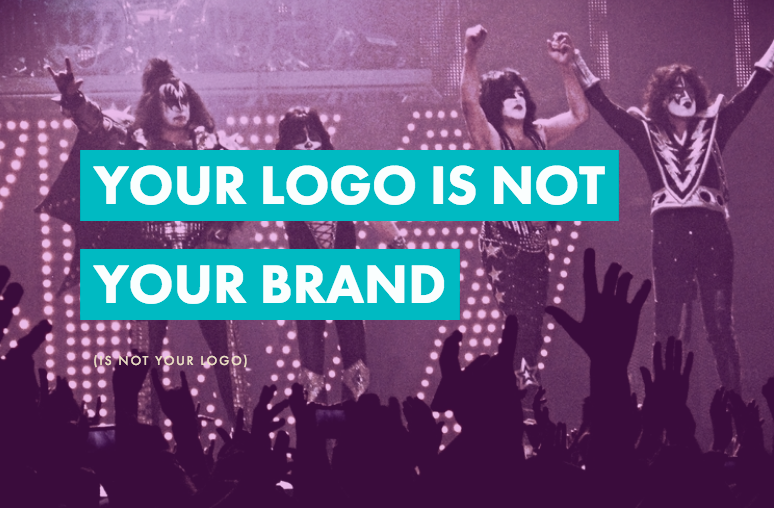 KISS are the godfathers of branding in the music world. However, KISS are not their logo. Their brand (in very short) can be boiled down to '4 guys in black and white face paint and a metal outfit, playing rock music'. Their logo reminds us of that brand. It's a visual hook. And, that's about it. Without the brand that same logo wouldn't mean jack. Other artists keep changing their logo, and others, like Madonna, don't even have one. The same with personality based businesses, there are plenty without, and they don't do any better or worse. So what about you? Do you need a logo? If the logo looks so good that you'd wear it on a t-shirt even if it wasn't yours - roll with it. Oh wait a minute, it doesn't? Skip it! Instead, show your pretty face and pick a nice font to write your (business) name in, and leave it at that for the time being. Some of the most iconic logos out there weren't created until the brand behind it already was huge. Think the Rolling Stones tongue. Or the Apple apple. Right now, you've got better things to do and spend your money on than logos. Know somebody thinking about getting a logo designed? Please share this link and help end the logo madness. And once you did that I'd love to know: Which are your favorite logos that you would totally print on your t-shirt? Sound off in the comments below. Like what you just read? Leave your email and receive more just like it. We keep your email safe! Thank you, my new favorite person, you! Check your email in a few minutes, I have a special invite for you!